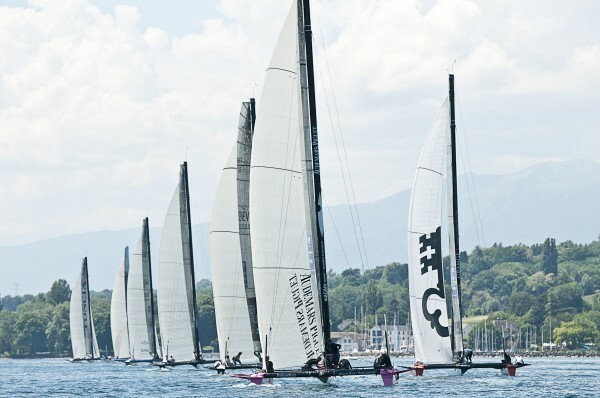 Today was the first day of racing for the D-35 fleet in the second event of the season, the Realstone Grand Prix d Crans. Unfortunately the wind was almost non existent but we did manage to have one race in very light conditions of 6 knots dropping to 4 at the finish. Onboard Artemis Racing with Torbjorn Tornqvist at the helm, we managed a 5th place out of 10 teams competing. Pretty good for Torbjorn's first multihull race. He was very happy with that and it is great to see him getting involved first hand in multihull racing since the Cup will be in Cats and he is obviously very passionate and committed to our America's Cup campaign. 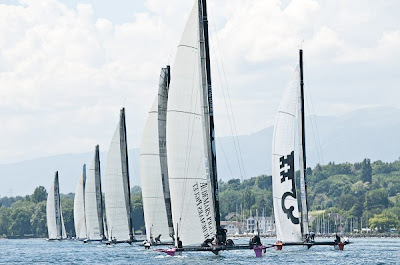 Alinghi continued their strong performance from the last event with a win today while the winners from two weeks ago, C.E.R finished just behind us in 6th today. The forecast for tomorrow isn't very good...light winds with the addition of rain possible. I spent last week in Valencia with our team. We had some very good sailor/design team meetings discussing the design of our AC72, deck layouts, etc. Terry Hutchinson and his crew of Rodney Ardern, Morgan Trubovich are on their way to Istanbul today for the Extreme 40 event there next week. Julien Cressant, who is sailing with us here in Switzerland on the D-35, will join them Monday to complete the X-40 crew.